CNBC: Lutz Calls Wagoner "Best. CEO. Ever." On CNBC this morning, GM product czar "Maximum" Bob Lutz said GM CEO Rick Wagoner is "without doubt the best CEO I've ever worked for." Well, duh. Have you seen the other CEOs he's worked for? The CEO at GM for the first four years was Frederic G. Donner and James M. Roche for the latter half of Bob's time at GM Europe in the 60s and 70s. Ah, those were the days. You know, when GM was totally getting sued for making cars "unsafe at any speed." While at BMW, the CEO was Eberhard von Kuenheim, who helmed the company from 1970 to 1993. During those 23 years, BMW went from 23,000 employees to 71,000 and annual revenue rose from €15 billion from €880 million. 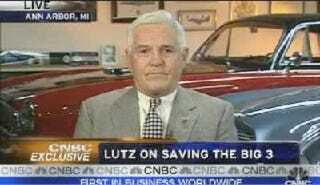 Maybe the best CEO Lutz has actually worked for, but this was in the 70s and he probably doesn't remember that far back. Bob got to work with all sorts of fun folks like Lee Iacocca and Henry Ford II during some of the most tumultuous years of the automotive industry. Well, until this year. Also helming Ford were non-luminaries such as Phil Caldwell and Don Peterson. Remember them? Yeah, we don't either. Bob actually IS the CEO here, so presumably he believes Rick's better than he is. We've no doubt of this. Bob workin' it with "Slick" Rick Wagoner where the two get along like peaches n' cream.